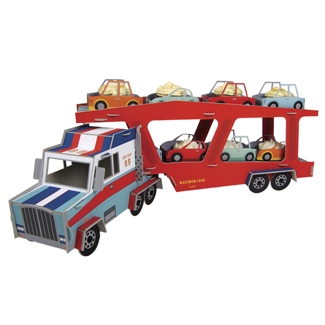 Brand: Meri Meri MR-0288 Units: 1 Dimensions: Assembled size: 12¾" wide x 11¼" long x 6¾" deep The Big Rig is a party centerpiece any little trucker will be delighted with! It comes in the form of a car transporter with eight cars. Each car is designed to hold a cupcake. Stand also plays 3 truck sounds! This self-assembly centerpiece is crafted from thick card that can be used again and again. Holds 8 cupcakes. The Big Rig is a party centerpiece any little trucker will be delighted with! It comes in the form of a car transporter with eight cars. Each car is designed to hold a cupcake. Stand also plays 3 truck sounds! This self-assembly centerpiece is crafted from thick card that can be used again and again. Holds 8 cupcakes.